Luxurious apartment in 2-family house in sunny, quiet location with wonderful views of the mountains and lake. 5 minutes walk to the lakeside baths and the promenade, 15 mins. walk to the centre of the village of Brienz. Separate kitchen with top quality white-ware and appliances (dishwasher, ceramic stove, large fridge with freezer etc). Living/dining room with hatch through to kitchen, fireplace, TV, radio/CD-player, video-recorder, computer with internet connection if required. 1 double bedroom, 1 bedroom with 2 beds, extra bed available plus cot if required. 2 bathrooms, 1 with bath + WC, 1 with shower + WC. Balcony on living-room and kitchen. Separate entrance. (Apartment size 95 m2). The chalet for the discerning customer is located on a wonderful south-facing slope with wonderful views of the mountains and partially the lake on a well-kept ground. Because of the slope, all flats have a garden area. The high-floor apartment has a balcony, the ground floor apartments have a spacious patio in a beautiful garden. All apartments have separate entrances and are equipped with a modern bathroom. About a marvelous way along a mountain creek with views of Lake Brienz can be reached in a few minutes walk to the lake and the long beach promenade of Brienz. Brienz with many shopping centers is about 10-15 min. Chalet Sonnenblick offers actually three apartments, spacious Sonnenblick 1 up to six adults, big studio-apartment Sonnenblick 2 for two persons (add. bedroom possible), comfortable apartment Sonnenblick 3 for small families and senior couples and Sonnenblick 4 (nearby) for two persons and kid until 6 years! Central, spacious and quite for a relaxed holiday. Very recommended for day trips in the Bernese Oberland. With endless hiking and swimming fun. Apartments for any concern: Sonnenblick 1 - 115qm, big living-room, 3 bedrooms, 2 bathroom. Sonnenblick 2 - 40qm, Studio, small kitchen, big bath with tube and shower. Add. bedroom possible! Sonnenblick 3 - 60qm, living-room, 1 bedroom, 1 bath. Sonnenblick 4 - 60qm, living-room, 1 bedroom, bath with spacious shower. The apartment is on a high living standard. Separate entrance and its own garden. By guest bathroom with shower also providing of food and drink (children, relatives, friends). The kitchen is comfortably equipped with 80cm ceramic field, dishwasher, refrigerator with a large freezer, oven, coffee maker, etc. A garage can be rented. Computers with Internet access on request. German, Austria., Swiss. and Italian television. Radio, CD and video. The apartment is well located with great views of the mountain ranges. It is dated and in need of some investment and tender love and care.Guests should be aware that the owner collects a tourist tax in cash on your first night, fortunately we had some Swiss francs. Trash needs to be placed in a specific bag. When requested from the owner we were advised to buy some at a local supermarket. Use of the washing machine is 10 francs for each day of your stay. It would be helpful if such details were advertised on the site. This our fourth stay in Brienz and can only rate this apartment 3 star simply because of the view. Guest was an experienced Homeaway user und rent himself. To separate the tourist taxes is the politics of homeaway,not from myself. every specific costs are on the homepage of homeaway. The garbage rule is coming from Brienz. I have given bags for free. Guest dont take the way describtion from homeaway and send SMS before arrival without name. How can i react? So the review seems very cost driven and a personal problem of one guest. They dont meet me at checkout as agreed at check-in. The apartment is very spacious. the kitchen is fully equiped. Great view of the alps from the balcony - we loved to eat there and have copy or fruits with the alps view that changes colors with the sun and clouds. Plenty of power outlets and a good WiFi connection. We were a family of five, but there is space for more. Quite comfortable place with all facilities (Nice garden, Balcony, Nice mountain view, Two bathrooms, Parking, Cozy bedrooms etc.,) - ideal for two families !.. Chalet is located in a convenient location - accessible to key sightseeing spots in 30 to 45 mins distance.. Rolf (Property owner) is very helpful and friendly. Overall we had a great stay...With no hesitation, I strongly recommend this place ! The chalet offer nice view of snow covered mountains and lake Brienz from the window of the chalet. The chalet offer good accomodation with proximity to Brienz city centre, railway station and shops. Rolf, the owner, was very helpful to make our stay very comfortable. Places like Jungfrou, Interlaken is just 30 minutes by car. Very nice guests. thanks. Interlaken is 10 - 15 min. by car. Chalet Sonnenblick is homely, quite and with a scenic view of Mountains and Lake Brienz. It is very well maintained, clean and well equipped. Very much suitable for 2 families with 2 separate toilets and showers. Near to local Bus Stop. Brienz is a beautiful place for Vacation. Reichenbach fall and Aareschlucht in Meiringen is very near from here and really worth watching. Mr. Rolf is friendly and flexible. We feel like coming over here again. The apartment was cozy and well maintained, had huge living room with magnificent view of the lake and mountain. Quiet environment and accessible with public transport (bus with scheduled timing/stop at Schwanden/Brienz) take about 15mins of walking downhill to the nearest train station (Brienz) and supermarket . Taxi is expensive, cost CHF15 for less than 7 mins ride. Owner, Mr Rolf is friendly, helpful and flexible guy. Overall the week stay was enjoyable and recommended for those who enjoy peace and quiet tranquility. 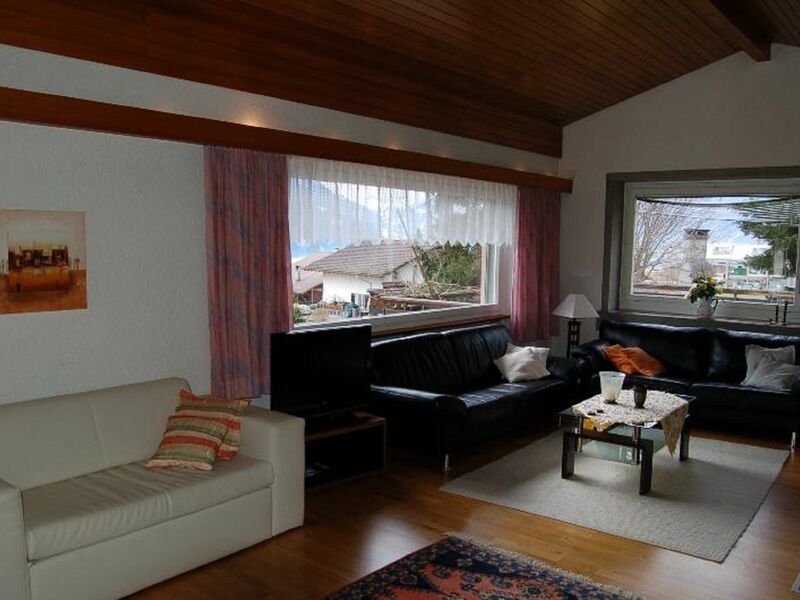 The apartment is located on the sunny Lake Brienz in the tourist area Haslital and Jungfrau. The holiday resort of Brienz offers all the possibilities offered by the beautiful location on the romantic, green lake Brienz in the Bernese Oberland. Enjoy the unique waterfalls Giessbach (Brienz) and Reichenbach (Meiringen). Enjoy the majestic panorama of the Eiger, Moench and Jungfrau of the world-famous mountain villages Wengen, Mürren and Grindelwald. Relax on a boat trip on the Lake Brienz and Lake Thun. Visit the world-famous tourist destination of Interlaken, located between Lake Brienz and Lake Thun with a unique view of the snowy peaks of the Jungfrau. Discover the sporting activities in the region with hiking, climbing, biking, windsurfing, paragliding, horseback riding, golf, swimming, skiing and luge and much more .... or enjoy the many excursions Ballenberg, Beatus caves, Tell Festival, etc., etc. Golf: A beautiful golf course is in Interlaken with vision and near the Lake of Thun. Servicegebühr 150 € Kurtaxe 3,50 €. pro Nacht, Kinder unter 6 frei. Bettwäsche, Handtücher etc.15,00 € pro Person/Aufenthalt (Pauschale für 4 Personen ist eingerechnet). Haustier 75,- € pro Woche. Garage 50,- € pro Woche. Waschmaschine 50 €. pro Woche auf Anfrage. Internet WiFi frei. Kaminholz frei, einmalig 25€ für Reinigung. Aufschlag ab 5.Person 15,- €/Nacht.